Here in California it's pretty common to have the growers on one side and the winery/winemaker on the other side as because or land price it's easier for wineries to buy fruit to growers. The issue with this type of relation is often that wineries aren't controlling the farming and get fruit that is grown with productivity and volume in mind, not quality. Here is Peter Martin Ray Vineyards [not to mistake with the Martin Ray Winery which is a conventional winery], a grower which is sought-after for its demanding vineyard management and excellent location in this part of the Santa Cruz Mountains. The parcels are located at the top of a hill next to the one with the historic Montebello-Ridge vineyards, and thanks to the farming, the altitude and terroir they grow beautiful grapes for a short list of wineries - Welcome to the uncharted vineyards of California... The grapes of Peter Martin Ray Vineyards are purchased by wineries like Ceritas and also Arnot-Roberts, which says it all by itself, and also by young winemakers like Jaimee Motley and the two guys behind Birichino Wines. I discovered this grower thanks to Frédéric Ballario who previously worked for AmByth, another exceptionnal domaine in that regard for its dry farming and non-interventionist winemaking in the very dry region south of Paso Robles (he now works for this little-known grower). You know that what makes the quality of a wine is basically the grapes and vineyard behind it, it's now obvious for everyone that you can't make good wine with improperly-managed vines and at the opposite, you almost can't but make good wine if the balance is there in the vineyard side. What is fully understandable for artisan winemakers is a problem for commercial-minded wineries where volume is considered as an imperative in their business. For the same price they'd rather buy high-yield, irrigated fruit to growers and do afterwards all sort of corrections in the cellar to get something their oenologist deem drinkable. It is encouraging to see both in the Old World and the New World that more and more rebels shrug off this mainstream approach and get back to the fundamentals of winemaking : the grapes. Another intriguing thing is also that this vineyard is located right in view of the Silicon Valley, that's not something we have in mind when we're thinking about California as a wine region, Napa Valley is way up north, but historically, these hills were central to the history of winemaking in this country. Here on the picture you can see, beyond the free-growing shoots of Peter Martin Ray's vines, the lights of Mountain View, Cupertino, Palo Alto, Menlo Park, where Google, Stanford, Facebook and other IT incubators are located. Very strange and exciting, here on the top of these hills it's all quiet and remoteness (driving to the property was a challenge, even the GPS didn't even see a road in the last couple of miles...) and down there it's uninterrupted cities and dense traffic. But let's go back for a minute to the origin of this vineyard : It all started indirectly with Paul Masson, a Burgundy native who left France for California in 1878 and ended up becoming the winemaker at the Almaden Vineyard and Wine Company. In the early 1900s he bought land in Saratoga and planted Pinot Noir and Chardonnay with wood from Burgundy, making sparkling wine for his Paul Masson Champagne Company which thrived making real wine at a time wineries in America would make a beverage they'd name wine using all sorts of odd fruits or components. But the prohibition put the lid on his promising business and Paul Masson ended up selling his winery years after the prohibition ended, not having recovered from it, "Paul Masson" later became a brand name not at all connected with his work (of course the jug wine sold under the Paul Masson label has nothing to do with him or his heritage...). Martin Ray was a kid living next door at the time of Paul Masson and he became a friend, working in the cellar and learning the trade. When Paul Masson sold the property, Martin Ray bought it, but several years later followed Masson's intial advice to instead plant vines on the top of the hill, what is now Mount Eden. Planting Pinot Noir & Chardonnay using Masson's wood, the Martin Ray winery was born and it was very close to what every artisan grower/winemaker is doing today, with hard work in the vineyard, healthy simple winemaking and parties with friends drinking nice Burgundy wines. Unlike what was done by then in America he introduced single-varietal wines, pushing for quality and excellence (Paul Masson had certainly done it too but he was the first to put it clearly on the label). Alas due to faulty business choices, Martin Ray sold much of his estate to investors and the name Martin Ray was sold as well and used by the ensuing wineries without the same philosophy and ethics. To make it short, today, Peter Martin Ray, the adoptive son of Martin Ray, keeps the family spirit by tending these few parcels, but he doesn't make wine, he just sells the grapes. Martin Ray made from the start terroir wines, a concept that was ignored here at the time (in the 1940s'). Martin Ray made the 1st mono-cépage (single varietal) wine, or at least put it on the label because Paul Masson also vinified this way but didn't tell it overtly. At the time in California you'd find "Chablis" for example or " Bordeaux", and this would be white or red blends made with whatever fruit the winery could find (not always grapes), sometimes it was made using fruit juice or concentrate... What is taken for granted today in California wasn't on the map then, you could make whatever you wanted and call it wine. Since his first vintage Martin Ray's wines were thus spotted and priced accordingly, this was for a niche clientèle but it worked and wine lovers recognized the real stuff. Journalists were interested by Martin Ray as well (there's one for example who was named Shoemaker), they realized he was making great wines but as in his opinionated outbursts he criticized the rest of the wine industry he was kind of shunned by the wine media of the time, they'd not relay his opinion to the public [we'd say today Martin Ray was shadow-banned, like Google/Twitter/Facebook do, using algorithms to discreetly silence opinions they don't want people to read]. Already at the time he was working with indigenous yeast and no sulfites and he liked to trash the mainstream wineries of the country publicly, saying repeatedly that they didn't make wine, while HE was making wine. Just think about what he used to say : I don’t care how a wine tastes, I care about how a wine drinks, that was so close to what the modern rebels feel all over ! Had the journalists made their work and relayed his words and unsettling opinion there could have been a faster awakening among the public regarding the gap between the way real wines & commercial wines are made respectively... Martin Ray was some sort of a pioneer for a real-wine approach which is now shared by an increasing number of winemakers and wine buyers alike. Because he's been blacklisted by the wine writers we don't have much record on him but the bottles remain and from those who had the chance to drink them it could be from magic to terrible. That's pretty close to what we hear about natural wine where sulfites-free wines can show faults or wonders [and many of the spotted "faults" could have been the result of improper reading of the organoleptic profile by tasters trained on formatted wines]. Here is the other iconic terroir on the next hill as seen from the Peter Martin Ray vineyards : the historic Ridge-Montebello vineyard, planted on land purchased in 1959 by David Bennion and his associates, at an elevation from 1300 to 2600 feet (400 to 800 meters) and 15 miles from the ocean with the aim to grow world-class Cabernet Sauvignon in this cool-climate corner of the Santa Cruz mountains (cool nights at least, the day time temperature is high in summer). Paul Draper (who retired in 2016) joined the winery in 1969 and helped attain this goal of excellence. These parcels are even higher in altitude than here and benefit from the same breeze between the Silicon Valley and the ocean. The area had been already planted before the purchase by the original owner Osea Perrone, that was in 1886. I've been told that Ridge-Montebello eventually added fruit from other locations alas for its iconic cuvée. Speaking of these Caterpillars they're probably from the 1940s', there's a D2 and another, smaller model. To start this machine, you start the 1st engine which in turns starts the 2nd engine. Peter Martin Ray, the adopted son of Martin Ray, is a former professor in botany. He is 86, retired and lives in Alaska with his wife; he still comes down here twice a year, first for a month every year in april to do farm work using these vintage Caterpillars and tractors for some plowing work between the rows, then at the end of august for the september harvest. Otherwise the daily vineyard management is done by Frédéric (who is here since 2015) and by Rick Anzalone who knows well the parcels and the vines. Peter took over the management of the property when Martin Ray passed away in 1976, he could make it stand for 10 years keeping making wine those years until it went bankrupt in 1986. He sold the name Martin Ray but kept the parcels and sold the grapes from then on to other winemakers. The house here was built around 1950 with the idea of receiving visitors who would stay a few days (Charlie Chaplin, John Steinbeck among others), large terrace, large living room and kitchen, there's a piano and fireplace, it looks like unchanged since these years. The road to the property was paved only 5 years ago and in the 1950s' it was basically a dirt road all the way to San Jose, it was indeed a remote retreat at the time even though you still feel it that way today. The vines have been grown on posts until 10 years ago when they put them on trellis. Here at this season they take a few laves out in order to let air flow through the canopy. The 3 acres of Pinot Noir (which goes to Arnot-Roberts) may be picked on a hot year around the 4th or 3rd week of august while the Chardonnay (6 acres) is ready on the 1st or 2nd week of september, the Cabernet Sauvignon being ready end of september or early october. The Cabernert is planted on 4 acres with different expositions, so there's always an earlier picking for part of it. there's of course room for additionnal replantings, possibly 10 acres, and the domaine could hypothetically be revived as a winery but this would need substantial investments. The whole property is exposed to winds coming from both the bay and the ocean (through the ridge). With both the altitude and the winds, they can reach a good balance in the grapes, particularly in the Cabernet Sauvignon. They do the farming along the wishes of the buyers of the grapes, and the respective winemakers decide for the picking dates, by the way both Ceritas and Arnot-Roberts pick very early, they do their sample picking and decide. Speaking of the picking teams it's more and more difficult to find pickers, especially with the new restrictions at the border and controls on companies hiring illegals. They manage to gather 20 or 30 pickers but they're less experienced than the ones you used to get in the past. Ceritas comes with a refrigerated truck in order to protect its grapes. For Arnot-Roberts it's a smaller volume which is fully picked at 9am usually and they can make without. Here the vines look younger but they were planted at the same time, it's just that they're struggling, one of the reasons being that when they prepared this land for planting they did some bulldozer work and part of the parcel ended up having a very shallow earth layer or was more stony than the rest, resulting in a much slower growth for the vines. You still see the irrigation hoses under the vines but they're not used. The Peter Martin Ray vineyards have a total surface of 13 acres (5,3 hectares), mostly planted in 1982, this was done by Peter Ray himself, the original parcels planted by Martin Ray belonging to the Mount Eden Winery now. Over here there's a mildew pressure with the ocean nearby, it's not excessive but they still have to do some sulfur dust, this is the only thing they do, starting when the shoots reach 6 inches, and stopping in july. There's no oidium here, so they dont need copper spray. While the Pinot and the Chardonnay suffer a bit under this particular climate and need more attention, the Cabernet Sauvignon thrives and Frédéric says that as a grower when you see the vines, you feel they're really at home. That's not a mystery why the Montebello is known as the best wine in this country, that's because it's the ideal terroir for Cabernet Sauvignon. Frédéric says he was lucky to taste Montebello wines from 1985 and there's such an evidence in these wines. For the vines that remained trained on post and not trellis they prune differently, they take two shoots which they bring back to the plant, this is what is called basket pruning, this is a technique that was brought here by Paul Masson from Burgundy, Martin Ray perpetuating it in his own parcels. And to this day they keep practicing this pruning on the vines, be they on posts or on trellis. The advantage is keep air flowing naturally in the middle of the canopy. Paul Masson didn't come from the prestigious Côte de beaune or even the Côte de Nuits but from a humble village of this wine region. At the time wine was made throughout all of Burgundy while decades after the Phylloxera debacle the producing surface shrinked. Frédéric landed here a couple years ago after learning (he was at the time doing the harvest elsewhere in the Santa Cruz mountains) that someone in the region was looking for someone to help manage a vineyard, this was actually Rick (pictured here) who was in charge of the work at Peter Martin Ray Vineyards. Although the place overlooks the Silicon Valley it's not easy to hire people, even unskilled workers, because it's so remote and it's a hard job needing good physical condition. It is his 4th year here and it's the 1st time he arrived that long. As a reminder Frédéric, who helped me do a visit at Krug in 2006, left France for California in 1999. 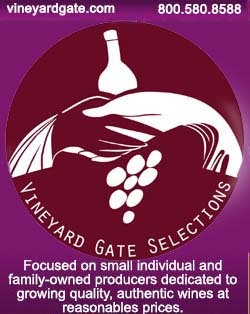 Rick Anzalone is born in the valley and has been working in the vineyard since 1977, when he did his 1st harvest season. His grandfather immigrated from Sicily in 1909 (he was 19 at the time). When he was here in America he volunteered in the U.S. Army because it was a fast-track way to the citizenship and he went back in Europe (in France) in WW1. I understand Frédéric loves to work in this setting. At the beginning he would commute from the other side of the valley but found an arrangement to live here which also allows a faster response when work is needed in the parcels. On this picture you can see from the background that this close to the Silicon Valley you have vast expanses of hills and mountains that are sparsely inhabited. At one point he showed me the different canopy style between theCabernet and the other varieties, the Cabernet Sauvignon's beeing less dense, less compacted which meand you get less stripping [of the leaves], it's already well aerated. The Pinot on the other hand behaves differently, the canopy becomes easily thick and they have to clear it regularly. Some of the vines have an impressive load of bunches, I ask if they do some green harvest but Frédéric says no : it's all dry farmed here and they keep all the grapes, the vines reach a balance in their fruit production when you dry farm, unlike the irrigated one which will produce a volume that has nothing to do with the real climate/soil conditions [and that's why these conventional wineries have to correct the wine in the cellar]. He says that during the 5-year-long drought they had low volumes, so when the vines get more generous, they keep the grapes, they're given by nature, not by interfering with the water supply. Plus they remain wise at the pruning stage, preventing at this stage an excessive production of grapes. An he says that when you prune you do it differently for each vine, depending of its strength and from what you think it can stand. Among the chalenges for the growers and the winemakers there's the question on when to pick. For example when there's a heat wave closing in around harvest time it's better to anticipate and pick right away, because if you wait after the heat you're done, the alcohol will be way too high. But the majority around here prefer wait, be above in terms of alcohol and then if needed add water in the juice and acid (in short, correct the wine) because they're afraid to be under the ripeness target. Frédéric says it's possible and doable to pick earlier : Ceritas for example picks the chardonnay here at 21.5 Brix and the wine is beautiful; you say that to conventional winemakers here they'd not understand, some never pick begore 24. For them, maturity is quality, and this is security too, plus you has this push by critics who rewarded power and oak, this didn't help. The whole building dates from around 1950 and same for the cellar underneath. It stayed untouched mostly since Martin Ray years, recently Peter Martin Ray's nephew is making a small volume of wine for himself and his friends & family, that's why you'll see a few barrels and some other containers for the topping up. The cellar is pretty cool, being under the house and partly dug into the hill, and there's a chai on the outside for the handling, pressing of the grapes, it's pretty ergonomic and well thought, it's made in cement and pretty easy to keep clean (with the cement slab) and even use gravity to move the juice and wine, the only thing is it was maybe a bit dry (we're used in France to have cellars that swell humidity, which turns out to be good for limiting topping up). This cellar could be almost be revived into production overnight in my mind, although Frédéric (who certainly has better experience than me) say it'd need some sizeable investment. If that happens one day, I hope the investors will ask for the implementation of a real winemaking in the spirit of Martin Ray as a prerequisite, otherwise what's the point ? This corker (La Mondiale) was brought back here by Paul Masson himself, and if you remember, it's the same vintage corker which Marcel Lapierre used when he did a bottling session in Paris on the sidewalk of the Caves augé for the Primeurs tasting of the wine shop (my story was in 2004). The disused cellar is full with Paul Masson's tools which Martin Ray later recovered, there's also a machine to put the wires on the bottleneck for the sparklings, this place is a gold mine. Ther's still the basket press, same color that the corkers, it came probably from France as well in thise years befor WW2. And on the right there's a long workbench where they'd fix things, this place is a real travel in time and many of these tools were certainly intially Paul Masson's, that a real chance to have all of these gathered in this cellar. __ Ceritas, Peter Martin Ray Vineyards, Chardonnay, Santa Cruz mointains 2015. Made from the grapes grown here. Fermented in barrels . 13,3 % alc. Such a beautiful minerality and tension. Frédéric says these qualities are directly related to the decision of Ceritas to pick early; they do their own sampling in the vineyard (even if Frederic & Rick do it on their side as well) and they decide of the picking date, which is much earlier than the California average. Here the alcohol is 13,3 % and they even made some at 12,2 % (and this is not the result of reverse osmosis or another artificial alcohol correction in the cellar). The mouth touch is so pure, there a saline quality, very nice wine. We had this with California cheese and California bread (both excellent, nice pairing with Ceritas' Chardonnay), thank you Frédéric for these details, I guess you had to leave your remote retreat to find these. __ Arnot-Roberts Pinot Noir 2016, Peter Martin Ray Vineyards, Santa Cruz Mountains. 3 barrels in total of this wine. 12,9 % alcohol. Man, nice wine too, we're enjoying the wine in the living room as dusk as fallen on the mountains, we're thinking about the time this room was bustling with guests and happy talk with the Burgundy wine Martin Ray liked to open for his guests... It's good that the name of the grower is printed on the labels, it makes justice to the wise vineyard management and dry farming, I hope it helps other wineries to emulate and follow this rustic vine cultivation. And this Pinot Noir is related with the wood/genetic material brought over here in California by Paul Masson in the late 1800's, the first from this variety in this region. The large kitchen in the background dates from the 1950s' as well like the rest of the building, it gives a unique charm to this house and was part of the experience. I hope if they renovate this place they'll keep this vintage furniture, there's certainly a way to add comfort while keeping the character and patina of the place. Frédéric oddly drinks tea at home, not wine or beer, and he knows and appreciate tea very much. he travels regularly (every year) to Taiwan where tea is cultivated and enjoyed with a rich background culture. He discovers more and more the the parallels between the two cultures and the two plants that share the notion of terroir. He also thinks about the cultural reasons behind the rise of wine and of tea respectively. The culture of wine is related to the monks in Burgundy who took in charge the vineyard, the planting and the winemaking, and tea owes much similarly to the Zen monks who were the first to cultivate tea gardens, bringing wild plants into organized cultivation in fields. Tea was to the Zen monks the same thing that wine for the Christian monks, a link from the sky to the earth. This trip was as much about visiting great growers and winemakers as travelling through the back roads away from the cities, scouting remote areas where no crowds are to be found. I travelled with my niece this time, it was her first time here and I'm happy she discovered the simple, unsophisticated country-life side, a world that is occasionally caricatured by the European media (and the US one as well, sadly) but which on the ground is full of friendly folks. We were having a beer an evening in a village in the middle of nowhere before driving back to the USFS campground miles away when the bartender told us this guy on the left had paid us another round. We chatted with them a few minutes, the guy on the right had lived most of his life in Alaska and had retired in this remote part of the country.